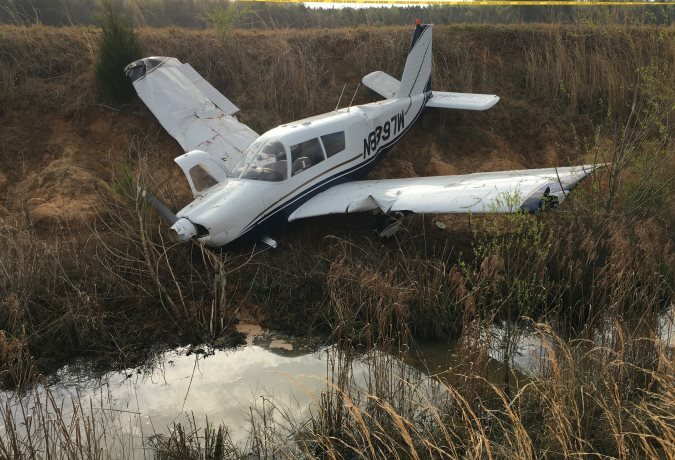 On March 29, 2019, at 1750 central daylight time, a Piper PA-28-180 airplane, N8397W, collided with an airport perimeter fence and a ditch after a runway excursion at Monroe County Airport, (M40), Aberdeen/Amory, Mississippi. The private pilot and passenger received minor injuries and the airplane sustained substantial damage. The airplane was registered to and operated by a private individual under the provisions of Title 14 Code of Federal Regulations Part 91 as a personal flight. Day visual meteorological conditions prevailed at the time of the accident and no flight plan was filed. The flight originated from Marion County-Rankin Fite Airport (HAB), Hamilton, Alabama about 1715. The passenger, who is also student pilot, stated that he had recently purchased the airplane and planned to take lessons from a flight instructor at M40 on April 1, 2019. He and the private pilot intended to reposition the airplane to M40 where it was to be refueled for the upcoming flight instruction. The private pilot was acting as the pilot in command and was manipulating the flight controls. He added that the flight was uneventful until the landing at M40. During landing, the airplane was slightly left of the runway centerline when it suddenly veered left. As the airplane continued off the left side of the runway, the private pilot attempted to go around. During the go-around the airplane collided with the north-south airport perimeter fence then continued into a ditch (figure 1). A review of the airport surveillance video revealed the wind was from the south about 5 knots. I wonder if the pilot in command was pressured by the owner/student to let him make the landing? Wind was coming straight down the runway so not sure why directional control was lost. Well it looked like it was a nice plane, now it will end up soda cans. Report states the certificated pilot was in command and manipulating the controls. Lots of things could have happened.